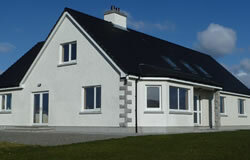 Airigh nam Fiadh is a new luxury eco friendly self catering property in South Uist. Airigh nam Fiadh has 2 double bedrooms (with en-suite shower rooms), a twin room with an adjacent family bathroom (with separate shower and whirlpool bath), a large open plan contemporary kitchen & dining area (with stunning views of the South Uist hills), utility room and living room with wonderful views of Loch Bee and the Cullins on a clear day. The house has underfloor heating throughout with a beautiful fireplace and multi fuel stove. West Gerinish is situated to the north of South Uist and is a great base for visits throughout the islands. The house is a short drive from a sandy beach and the ocean. The village remains true to its crofting background with may of the locals keeping cattle and working the machair lands which make Uist so unique. Gaidhlig is the native tongue in the village and you'll no doubt pick up at least a few phrases by the end of your visit.